AI Suite Event Processor: Used to trigger operations when events occur. Events can be, for instance, the arrival of a file in a folder or time-based alert. An operation can be: importing a file in InterPlay or Datastore or starting a Rule Engine session. An Event Processor is embedded in each AI Suite component. The configuration of the Event Processors is done in Administration for the event listeners and in Designer for the flow definition. AI Suite REST services: A set of REST API to execute operations (import, export, purge). Main data flow refers to the standard processing of financial input events inside AI Suite. It describes main processes and lifecycle of financial events. Send Input events to Rule Engine Server: Input events are received from external financial systems and are sent to Rule Engine Server to be processed by a Rule Engine. 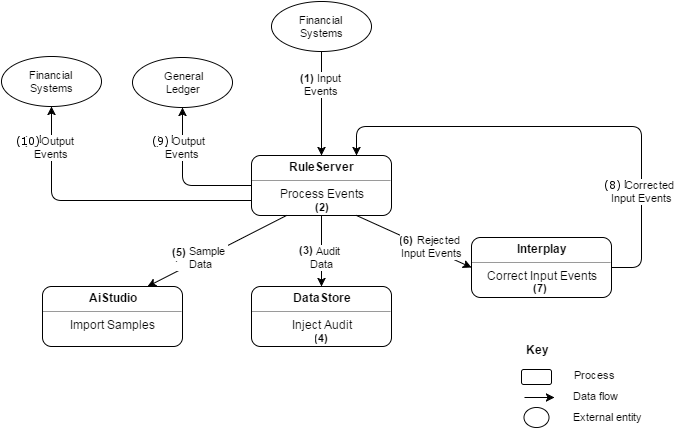 Process events: The Rule Engine Server executes business rules (transformation, aggregation and audit) and generates output events, rejected input events and audit data. Send audit data to Datastore: Audit data is sent to Datastore to be injected in its database. Inject audit data in Datastore: Datastore loads audit data injects it in its database where it is kept for audit proposes and can be visualized using Datastore's specific API and user interface. Send sample data to AI Suite Studio: Rule Engine Server sends sample data to AI Suite Studio where it is stored. Send rejected Input events to InterPlay. Correct Input events: Load rejected data into the InterPlay database. The user can correct data using the InterPlay UI and then export the corrected data. Send corrected events to Rule Engine Server. Send Output events to the general ledger. Send Output events to other financial systems.